Allen Hex Torx Key Sets. 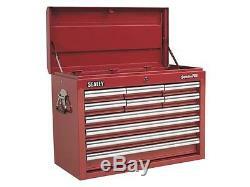 RED 10 DRAWER BALLBEARING RUNNERS TOOLBOX TOOLCHEST HEAVY DUTY. Tools You Need For All Automotive Jobs. Topchest 10 Drawer with Ball Bearing Runners - Red. &###x2022; All heavy gauged steel construction and manufactured with steel inner walls for extra strength and durability. &###x2022; Heavy-duty 45mm ball bearing drawer runners provide superior performance and carry heavier loads. &###x2022; Full height rear locking mechanism, locks full-length drawers in multiple locations. &###x2022; Added security provided by tumbler lock, supplied with two folding keys. &###x2022; Rust and solvent resistant powder coat paint finish. &###x2022; Each drawer features aluminium drawer pulls and non-slip liners. 660 x 315 x 485mm&##xA0. Small Split Drawer (x6):&##xA0. 165 x 270 x 45mm&##xA0. 560 x 270 x 45mm&##xA0. 560 x 270 x 70mm&##xA0. Monday to Friday 8.00am to 5.00pm. Saturday 9.00am to 1.00pm. Please always read the description. The idea for Tool Academy Ltd was conceived by the retirement of 92 year old Ken Seaman in 2007. I have known Ken since 1965 when I was first apprenticed at Cotgrave Service Station. We arranged to visit him one Sunday morning at his home, bought the stock, hello the The Tool Academy. (01623 555512) With 50yrs experience of repairing vehicles we feel well qualified to trade within the automotive sector as a supplier of tools & equipment. This is where our business has the advantage over our competitors, we carry a large stock for immediate supply or the promise that non stock items can be dispatched within 48hrs. With having our own up to date workshops we have a wealth of experience & skill to advise on any questions we are asked , from technical data to how the items works. If we cannot answer the query we have the contacts of 34yrs experience in the business to find out the correct answers for you. You can add these instructions on to your checkout if preferred, in the Additional check out instructions section. Once goods have been delivered to you they will be held at your own risk and we will not be liable for their loss or destruction. We shall have no liability to you for any failure to deliver goods you have ordered or any delay in doing so or for any damage or defect to goods delivered that is caused by any event or circumstance beyond our reasonable control including, without limitation, strikes, lock-outs and other industrial disputes, breakdown of systems or network access, flood, fire, explosion or accident. Our acceptance of your order brings into existence a legally binding contract between us. Price 2.1 The prices payable for goods that you order are as set out in our website. You do not need to give us any reason for cancelling your contract. 3.2 To cancel your contract you must notify us in writing. 3.3 If you have received the goods before you cancel your contract then you must send the goods back to our contact address at your own cost and risk. Cancellation by us 4.1 We reserve the right to cancel the contract between us if: 4.1.1 we have insufficient stock to deliver the goods you have ordered; 4.1.2 we do not deliver to your area; or 4.1.3 one or more of the goods you ordered was listed at an incorrect price due to a typographical error or an error in the pricing information received by us from our suppliers. We will not be obliged to offer any additional compensation for disappointment suffered. 6.2 If you do not receive goods ordered by you within 10 days of the date on which you ordered them, we shall have no liability to you unless you notify us in writing at our contact address of the problem within 15 days of the date on which you ordered the goods. The importation or exportation of certain of our goods to you may be prohibited by certain national laws. 6.7 Notwithstanding the foregoing, nothing in these terms and conditions is intended to limit any rights you might have as a consumer under applicable local law or other statutory rights that may not be excluded nor in any way to exclude or limit our liability to you for any death or personal injury resulting from our negligence 7. Notices 7.1 Unless otherwise expressly stated in these terms and conditions, all notices from you to us must be in writing and sent to our contact address at YOUR ADDRESS PLEASE and all notices from us to you will be displayed on our website from to time. Events beyond our control 8.1 We shall have no liability to you for any failure to deliver goods you have ordered or any delay in doing so or for any damage or defect to goods delivered that is caused by any event or circumstance beyond our reasonable control including, without limitation, strikes, lock-outs and other industrial disputes, breakdown of systems or network access, flood, fire, explosion or accident. Invalidity 9.1 If any part of these terms and conditions is unenforceable (including any provision in which we ex-clude our liability to you) the enforceability of any other part of these conditions will not be affected. You may be asked to sign in. Next to your listing, select Return this item from the pull-down menu. The "Return an item" form appears. This listing is currently undergoing maintenance, we apologise for any inconvenience caused. The item "RED 10 DRAWER BALLBEARING RUNNERS TOOLBOX TOOLCHEST HEAVY DUTY" is in sale since Tuesday, September 6, 2016. This item is in the category "Vehicle Parts & Accessories\Garage Equipment & Tools\Tool Boxes & Storage\Other Tool Boxes & Storage". The seller is "hardwick1982_on" and is located in Sutton-in-Ashfield. This item can be shipped worldwide.